ARDF - Amateur Radio Direction Finding - is an exciting branch of amateur radio activities, attracting people from youngsters and teenagers to experienced old timers and veterans. Participants of these events arrive to the spot annouced by the organiser, dress the sport garments suitable for running and start in small groups to meet the direction finding adventure. Their task is to discover - by taking radio bearings - four or five hidden low power transmitters, located in a forest in adequate distance each from other. The discovery of hidden transmitter has to be confirmed by personal presence at the spot and punching the starting ticket. The winner of the event is an amateur who discovers, visits all prescribed transmitters and appears at finish line in a shortest possible time. ARDF joins the amateur radio skills like construction of transmitters and receivers, knowledge of HF and VHF propagations phenomena, antenna patterns, evaluation of strenght and quality of received signals (and basic knowledge of Morse code, too!) 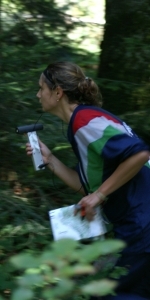 with orienteering skills like proper using of map and its symbols, usage of compass and taking bearings and azimuths, continous knowledge of own position in the terrain (without using of GPS satellite equipment), and - last but not least - with physical fitness and ability to run a couple of kilometers in diversified terrain, mostly wooded. But over all, ARDF is a pleasure of being in direct contact with nature, of breathing the fresh and unpolluted air, of joining with friends from diffrent amateur radio clubs and societies. It is an unforgetable experience to meet - when running from one hidden transmitter to another - a deer family or lonely hare wondering who disturbs his quiet forest enclave. Tens and hundreds of ARDF events are organized every year by the local amateur radio clubs, amateur societies and on the highest level - by the International Amateur Radio Union. ARDF is not only a joy for its enthusiasts. It is a powerful tool for attracting people, especially youngsters, towards the amateur radio. A thousands of nowadays experienced transmitting amateurs have started their amateur radio activity as ARDF competitors in a junior category. ARDF is the only amateur activity open to the public - usually there are hundreds of spectators at the start and finish of big events like regional or worldwide championships, which are usually served by the media - press, radio and TV. Thus - ARDF is a powerful tool of informing the society on the existence and aims of amateur radio. From the point of IARU and its international tasks - ARDF is often a mean of attracting the amateur societies in developing countries, leading them to join IARU. Amateur radio direction finding on Wikipedia: More information, pictures, links, other languages.